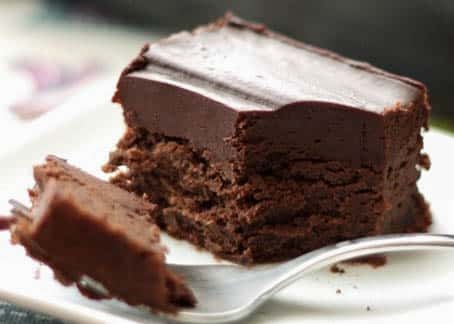 Designed to be served cold from the refrigerator, this is a rich dark chocolate cake topped with an absolutely amazing chocolate frosting. It’s wonderfully unique and completely unforgettable. Just thinking about this cake was enough to have me making it again this week. I told myself that I was making it so that I could shoot a video (see below) and share it with you, but really? I just wanted to have this awesome cake tucked into my refrigerator this week. It’s disappearing a sliver at a time, just the way it’s supposed to. 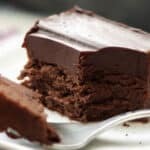 My friend Sue shared this Cold Chocolate Snacking Cake recipe on her blog years ago and I couldn’t get it out of my mind. In this food laden world of blogging, I run across a whole lot of recipes that make my mouth water. I have Pinterest boards filled with other blogger’s creations and binders overflowing with my own recipe ideas as well. There just isn’t time to try them all! However, this cake stands out among so many other chocolate cakes. It truly rocks and you do not want to miss a chance to make it. Consider yourself warned, it’s almost impossible to just eat one sliver. I loved the cake and the frosting… oh my heavens. The frosting is amazing! I recommend just leaving a knife in the pan with the cake. You’ll need it each time you open the refrigerator to trim up the edges on the cake. Preheat the oven to 350 degrees. Grease a 9 or 10-inch square pan with butter. 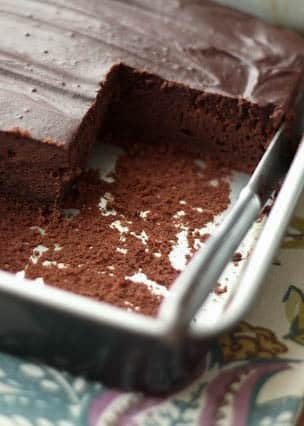 (You can use a 9x13 pan, but the cake will be thinner, so reduce the cooking time accordingly.) Whisk together the flour, baking powder, salt, and cocoa powder in a small bowl and set aside. In a large mixing bowl, cream the butter and sugar until light and fluffy. Add the eggs and vanilla and beat again to combine. Add half of the dry mixture, beat to combine. Add the sour cream and stir again to combine. Finish with the last of the dry ingredients. Pour the batter into the prepared pan. Tap the pan several times on the counter to force out any air bubbles. Bake for 30 minutes, until a toothpick inserted in the center comes out mostly clean, with only moist crumbs. Let the cake cool to room temperature. The cake will be slightly domed when you first remove it from the oven, but it should level out on top once it cools. While the cake is baking, make the frosting. Heat the cream on the stove-top over low heat until steaming, or in a medium size glass bowl in the microwave until simmering. Add in the chocolate and let it sit for a few minutes. Stir or whisk to combine, until the chocolate mixture is smooth and glossy. Add the sugar and cocoa powder and stir until completely smooth. Refrigerate the frosting for about an hour and then spread it over the cooled cake. Place the cake in the refrigerator to chill until the frosting is set, at least two hours. Serve cold. Enjoy! For a gluten-free alternative: Substitute 1/2 cup brown rice flour and 1/4 cup tapioca starch for the all-purpose flour in this recipe. I love using this pan for this cake. The handy lid makes it super easy to store and the transport the cake, if needed.